We are excited to announce the general availability of Azure SQL Database reserved capacity, now available for single and elastic pool databases—expanding our commitment to making Azure the most cost-effective cloud for your workloads. This new pricing option enables you to save up to 33 percent1 compared to license-included pricing by pre-paying for your SQL database vCores for a one or three-year term. Today, customers with active Software Assurance can save up to 55 percent using Azure Hybrid Benefit for SQL Server with the new vCore-based purchasing model in SQL Database. 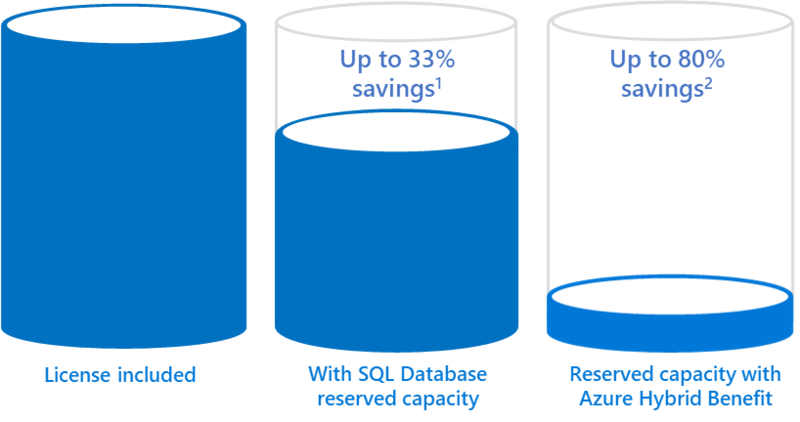 With support for reserved capacity on single databases and elastic pools, you can unlock even more savings when you combine your Azure Hybrid Benefit with reserved capacity pricing to achieve savings of up to 80 percent2. 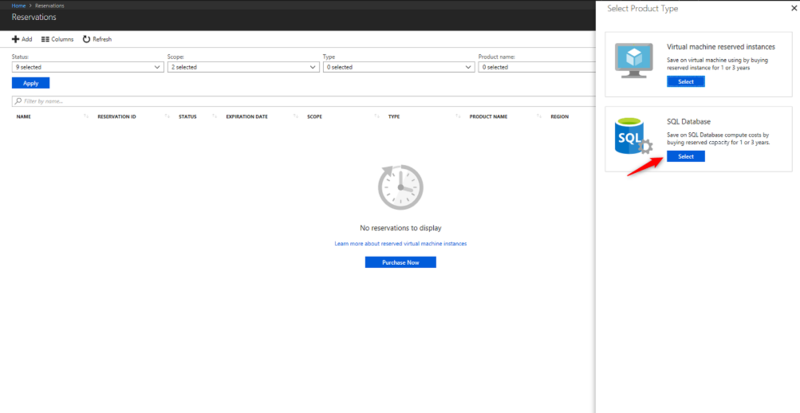 If you’re facing end of support for SQL Server 2008/2008 R2 on July 9, 2019, you can migrate your workloads to Azure SQL Database, a fully-managed service, and eliminate end of support transition costs. Azure Hybrid Benefit lets you use your existing licenses with active Software Assurance to save more on Azure, and now reserved capacity makes the move to Azure SQL Database even more cost-effective. SQL Database reserved capacity pricing is scoped to either a single subscription or shared. It allows you to control how many subscriptions can use the benefit and how the reservation is applied to specific subscriptions. A reservation scoped to a single subscription means that the reserved capacity discount will apply to SQL Database resources within the selected subscription. A reservation with a shared scope means that the billing benefit can be shared across any subscription in the enrollment (i.e., Enterprise Agreement customers) or account (i.e., Pay-as-you-go customers), except for MSDN subscriptions in the enrollment or non-Pay-as-you-go subscriptions in the account. SQL Database reserved capacity provides vCore size flexibility so that you can scale up or down within a performance tier and region without impacting your reserved capacity pricing. For example, if you purchase 16 Gen5 vCores of reserved capacity for SQL Database general purpose and decide to deploy a 4 vCore database and an 8 vCore elastic pool, both with Gen 5 compute, your reserved capacity benefit will automatically apply to both. If you decide to scale up your database to 8 vCores, the reserved capacity benefit will also automatically apply. You also have the flexibility to temporarily move your hot databases between pools and single databases as part of your normal operations, within the same region and performance tier, without losing the reserved capacity benefit. By keeping an un-applied buffer in your reservation, you can effectively manage the performance spikes without exceeding your budget. SQL Database reserved capacity is initially available to single databases and elastic pools, with managed instance support coming in the future, and can be purchased through the Azure portal. For more information on reserved capacity pricing, please visit the SQL Database pricing page and review our documentation. 1 Savings based on eight vCore SQL Database managed instance general purpose in West2 US region, running 730 hours per month. Savings are calculated from on demand full price (license included) against 3-year reserved capacity license Included. Actual savings may vary based on region, instance size, and performance tier. Prices as of May 2018, subject to change.